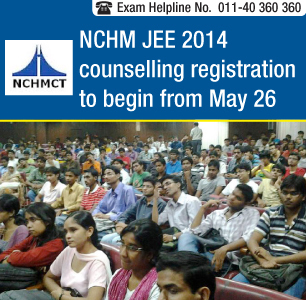 National Council of Hotel Management and Catering Technology will begin registration for NCHM JEE 2014 counselling from May 26, 2014. Earlier, the information brochure had stated that counselling activities would commence from first week of June. NCHM JEE 2014 exam will be conducted in paper-pencil format on April 26, 2014 at 33 centres across India. Registration process for the online counselling and choice filling will start from May 26, 2014 and end on June13, 2014 at 5.00 pm, followed by multiple rounds of mock counselling. L.K. Ganguli, Director (Accounts & Finance), NCHMCT told Careers360 that Choice modification for 2nd round of counselling will take place in online mode and can be exercised from June 25 to June 27, 2014 till 5.00 pm. The change in counselling schedule has been made in accordance with NCHM application deadline, which was extended till April 11, 2014. There are three rounds of counselling, and SPOT round seat allotment will close on July 10. Counselling involves choice filling by qualifying candidates for desired hotel management institutes. NCHMCT has extended application deadline for undergraduate programme in B.Sc. in Hospitality & Hotel Administration till April 11, 2014. Earlier, the last date of application was April 7, 2014. According to official sources, more than 20,000 candidates have registered for the exam this year whereas in 2012-13 the total number of applicants was 15,215.